Yahoo is shuttering a dozen of its products and services, including the once-popular search engine AltaVista, the company announced today. 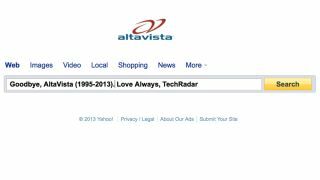 AltaVista was one of the web's earliest search engines, having launched in 1995, but it lost ground to then-chief rival Yahoo and later Google following the burst of the dotcom bubble. Yahoo would eventually buy AltaVista when purchasing the search engine's parent company, Overture. AltaVista is slated to be closed on July 8, making it a just over 18 years old. As of today, the same fate has been met by browser plug-in Yahoo Axis, browser extension Yahoo Browser Plus, and sports site Citizen Sports. Yahoo WebPlayer, FoxyTunes, and Yahoo RSS Alerts meet their end at the top of the month, while Yahoo Neighbors Beta also moves out on July 8. Yahoo Stars India is being folded into Yahoo India OMG! on July 25, and Yahoo Downloads Beta stops supporting third-party downloads on July 31. On Sept. 28, Yahoo Local API and Yahoo Search Term Extraction API meet the dustbin of history, too. Yahoo's post revealing the shutdown of these dozen services was entitled "Keeping our Focus on What's Next." To that point, the company announced that it will expand Flickr features to include integration in Yahoo Mail. "Much like our Dropbox integration, all you have to do is click the arrow next to the paperclip and choose 'Share from Flickr,'" wrote Yahoo is a Tumblr announcement. Members of the photo-sharing service shouldn't find the uploading process too difficult as they're already logged into Flickr thanks to it's joint account status with Yahoo Mail. "Not only is it simple to share as many Flickr photos as you'd like, but they're displayed in a beautiful way, just like they are on Flickr itself," said the company. "Since you send email daily, this is more of a reason to fill up your shiny new 1 terabyte of space on Flickr with all of your photos." Under Marissa Mayer, Yahoo has seen some big changes, from the redesign of Flickr, to the purchase of Tumblr. Did you miss the Flickr redesign? See our first look at the new Flickr.